This fabulous Card Trick quilt block is like a jigsaw puzzle. 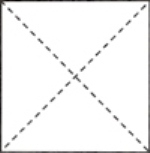 You must cut all the triangles and sew them together into squares as shown above. Look carefully at the picture to see that there are 9 squares in total in this quilt block, three squares each in the top row, three in the middle row and three in the bottom row. - One 5 1/4" strip. From that, cut one 5 1/4" square. - Cut the 5 1/4" square twice diagonally, making four quarter square triangles. From the same strip, cut two 4 7/8" squares. Cut these in half diagonally, making four half square triangles. One 5 1/4" strip. From that, cut one 5 1/4" square. Cut into quarter square triangles. You will have two triangles of each color left over. From the same strip, cut one 4 7/8" square. Cut into half square triangles. Sew one quarter square triangle of each color to one quarter square triangle of background fabric. Press seam toward the darker fabric. Sew one half square triangle of each color to one half square triangle of background fabric. Lay all your pieces for the Card Trick block beside you so that the shapes form the pattern shown above. 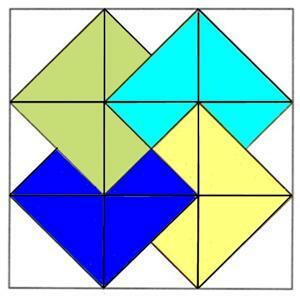 Notice that four different quarter square triangles form the center square. After laying the block out beside you, sew the correct triangles together, then sew the resulting squares together to form the block. The block is put together in rows. Sew the top three squares together first, pressing the seams toward the center of the block. Then sew the second row of squares together and press the seams toward the outside of the block. Sew the third row of squares together and press seams toward the center. Now sew the top row to the second row, matching seams. Sew the third row to the second row, again matching seams. Your are done with the Card Trick Quilt Block pattern. Finished with "Card Trick Quilt Block?" Return to "Learn to Quilt"
Or go to "Ohio Star Quilt Block"